BendPak, a global leader in wheel alignment technology is proud to offer these best-in-class precision turnplates for alignment lifts and high accuracy applications. Measure a variety of wheel angles with these premium, free-floating wheel alignment turnplates. Aluminium-alloy construction combines with a polished stainless steel bearing surface and oversized upper radius plate to provide unsurpassed, long-term accuracy. Hundreds of smooth-polished, abrasion-resistance Delrin™ balls have a low coefficient of friction and deliver precision movement under extreme conditions. These turnplates are truly inspiring. We’ve significantly increased the size and number of rollers under the turnplate, resulting in more controlled roll-backs. The plate remains stable in the event a vehicle is rolled onto the plate slightly off-centre. This ensures alignment readings remain as accurate as possible. When you’re not doing alignments and roll-back adjustments, you probably want to use your ​alignment lift as a service or storage unit. During that time, you won’t need or want to use the ​turnplate. So, we designed two thick lock pins that secure it in place. Two hard-rubber popsicle sticks slip perfectly between the turnplate and the rest of the runway. This creates a perfectly level surface—no gaps—making it easier to cross over the turnplate without disrupting the alignment. When using your ​lift as a parking or service ​lift, operators can pull vehicles forward with greater ease. Even though these turnplates are larger and their design more robust, durable ​aluminium the way of the future for many structures in the auto industry. 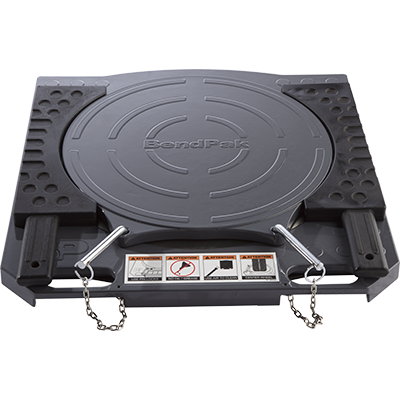 Without sacrificing quality (in most cases, improving it), BendPak can offer a larger, lighter turnplate that’s easy to manage, install and maintain. Includes two hardened rubber "popsicle stick" rollback bridges that eliminate the gap between the turn plates and ​lift runways for a smooth transition during rollback procedures or when loading and unloading vehicles. Greaseless operation. No maintenance or mess.